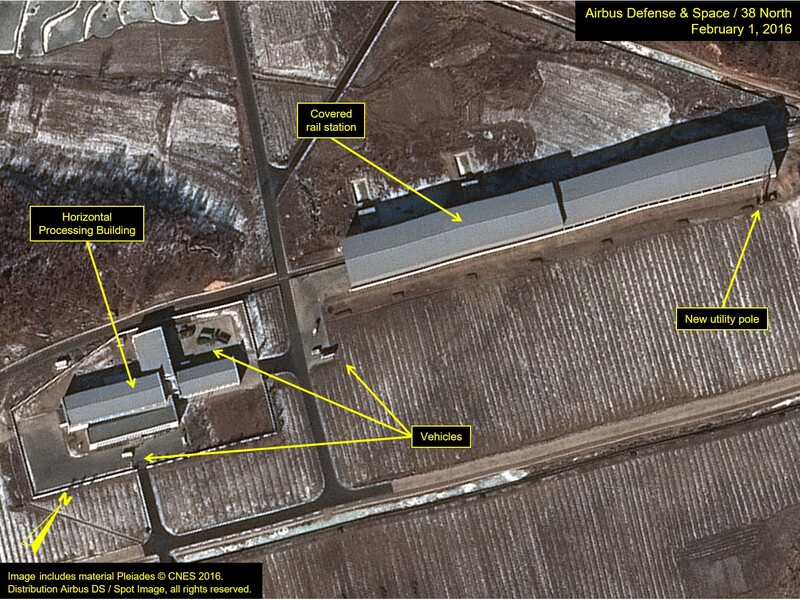 Editor’s Note: With North Korea’s recent notifications to the International Maritime Organization (IMO) and International Telecommunication Union (ITU) that it would launch an “earth observation satellite” between February 8 and February 25, 38 North has initiated a series of brief imagery analysis updates to closely follow developments at the North’s Sohae Satellite Launching Station (“Tongchang-dong”). This is the first of these updates. 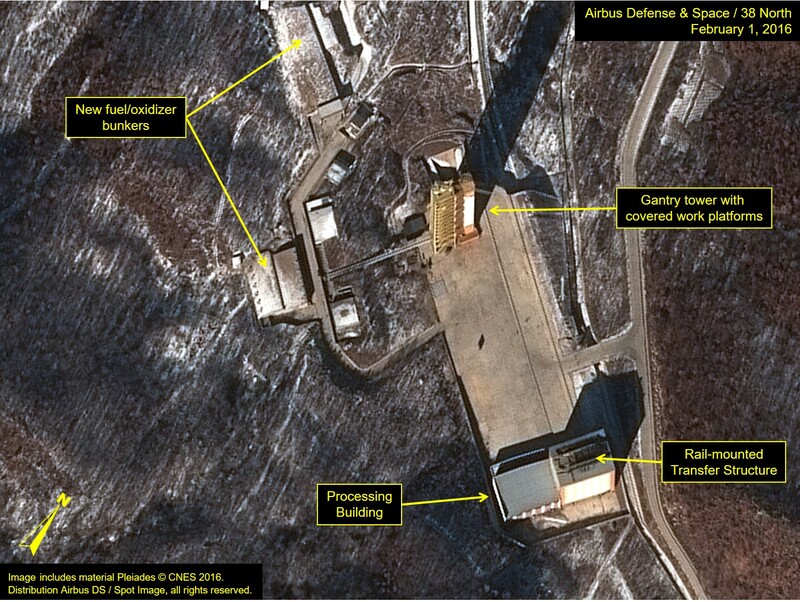 Recent commercial satellite imagery indicates that the level of activity at the Horizontal Processing Building at the Sohae Satellite Launching Station (“Tongchang-dong”) is suggestive of preparations for a space launch and supports North Korea’s announced launch window of February 8 through 24. During past launches, this building has been used to receive the various rocket stages. Once received, they are assembled in the horizontal position to test all connections, perform final testing of subsystems and prepare the stages for mounting on the launch pad. Specifically, on February 1, there are nine vehicles present, of which two are likely to be buses. Compared with only one vehicle present on January 25, this level of activity is similar to that seen prior to the previous launch in 2012 and is suggestive of launch preparations. At the nearby covered rail station, the shed roof obscures the view of any activity within. On February 1, a small utility pole (i.e., for lighting or communications) has been erected near the northeast corner of the shed. Figure 1. Increased activity at the Horizontal Processing Building and rail station. 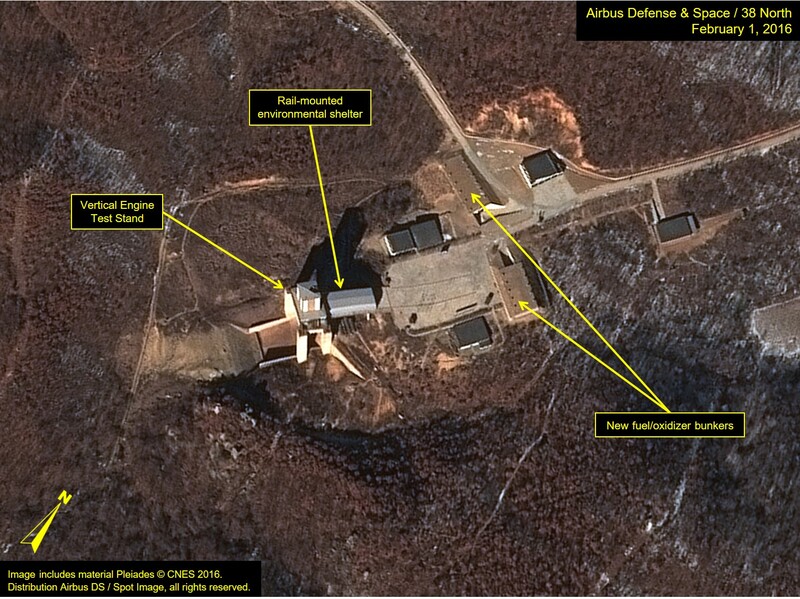 Recent imagery indicates no significant changes at the Sohae launch pad since last viewed on January 25. The work platforms on the gantry tower remain folded forward, with the environmental covers in place, obscuring any activity that might be taking place within. It is also not possible to see whether a space launch vehicle (SLV) is already present within the utility platforms. No personnel or vehicles appear present elsewhere on the launch pad or in the fuel/oxidizer bunker. The rail-mounted transfer structure, which will likely be used to move the various rocket stages from the underground station or the stationary processing building to the launch pad, remains at the south end of the pad adjacent to the stationary processing building. Although there is no activity indicating an imminent launch, the gantry tower and launch pad complex appear to be in a condition capable of conducting a launch within the announced launch window of February 8 through 24. Figure 2. Environmental covers still obscure any activity that might be taking place inside the gantry tower. There are no significant changes at what is believed to be the launch control building. The structure appears to be in good condition. Activity at this facility should increase as the launch date grows closer. No activity is noted at the building North Korea has previously identified at the Satellite Control Building. On January 25, there were five vehicles present in the two buildings in the VIP housing area. By February 1, only one vehicle is present. Extended vehicle activity in this area—seen prior to the 2012 launch—could mean that scientists and engineers are present. There are no significant changes at what is believed to be the National Aerospace Development Administration (NADA) Auditorium between January 25 and February 1, although the adjacent helicopter pad had been cleared of snow. Guests, dignitaries and workers would view the launch from this location. Activity noted at the vertical engine test stand during the last month indicates that an engine test could be conducted at any time and with little prior notice. There are no significant changes noted at the vertical engine test stand between January 25 and February 1. The rail-mounted environmental shelter remains immediately adjacent to the test stand. No personnel are visible and there are no indications that an engine test has recently taken place. The complex appears capable of conducting a test at any time. Figure 3. Engine test stand appears ready for use.